In 1838 Samuel Morse created Morse Code which, via a series of on or off-tones, dots and dashes, allowed complex messages to be conveyed over long distances. During the Crimean War Signallers provided communications. The electric telegraph was first used in a war environment to transmit Morse Code and telegraph wagons and cable carts were used. A significant advance in communications was the invention of the telephone by Alexander Graham Bell in 1876. From the earliest of times armies have used some form of signalling. The Greeks had the torch telegraph and the water telegraph, the Roman Army used coloured smoke as a means of communication and in 16th century England beacons were used.In the 1790s the way we communicate took a significant and sophisticated leap forward. Until the 1750s any long range communication was via horseback, ships or similar and relied primarily on individuals transporting messages; then in 1790, in France, Claude Chappe invented a telegraph ( tele = far, graphos = writing ) system. The British learned about this, decided they needed to improve the way they communicated and subsequently a handful of people patented systems. 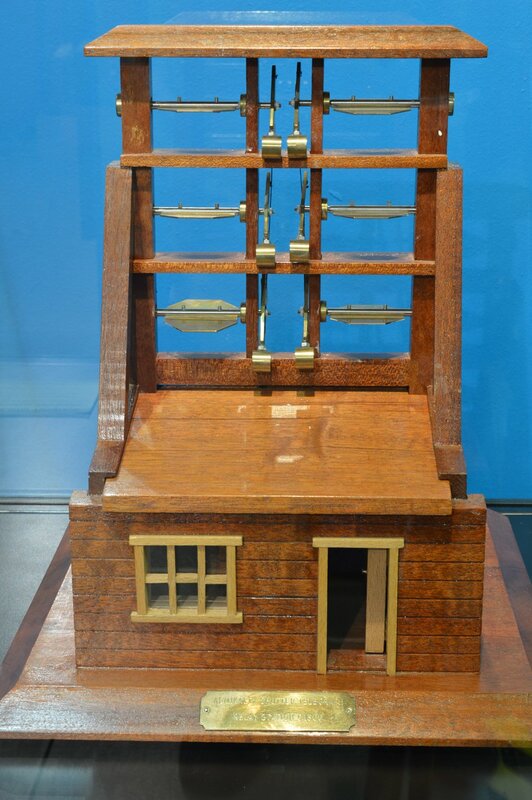 One such was a shutter-type machine, known as the ‘Murray Lettering Telegraph’ or Shutter Telegraph adopted by the Admiralty in 1796 and successfully used to communicate between London and Devonport. A year later the Army introduced the Radiated Telegraph System; this was more mobile system than the Murray Telegraph and remained in use throughout the Napoleonic wars. Electric batteries were invented at the turn of the century but it was only when electro-magnets were invented, some twenty years later that messages could be sent more than a few metres. This system was adopted by the new railway companies who were able to send messages between signal boxes using telegraph lines beside the track. Work to advance communications continued but it wasn’t until the 1830s that two key technological developments – the invention of the Electric Telegraph an in 1838 Samuel Morse created Morse Code. Morse was a code which, via a series of on or off-tones, dots and dashes, allowed complex messages to be conveyed over long distances. Morse stood the test of time remaining in use as an international standard for maritime distress until the end of the twentieth century. The casualties and battle failings of the Crimean are well documented, perhaps none more famously than via Alfred Lord Tennyson’s narrative poem Charge of the Light Brigade, documenting poor communication and a deathly advance. Some of the technological and communication advances are less well known; indeed It was during the Crimean War that specialist soldiers, The Signallers provided communications alongside other battlefield duties, the electric telegraph was first used in a war environment to transmit Morse Code and telegraph wagons and cable carts were used. 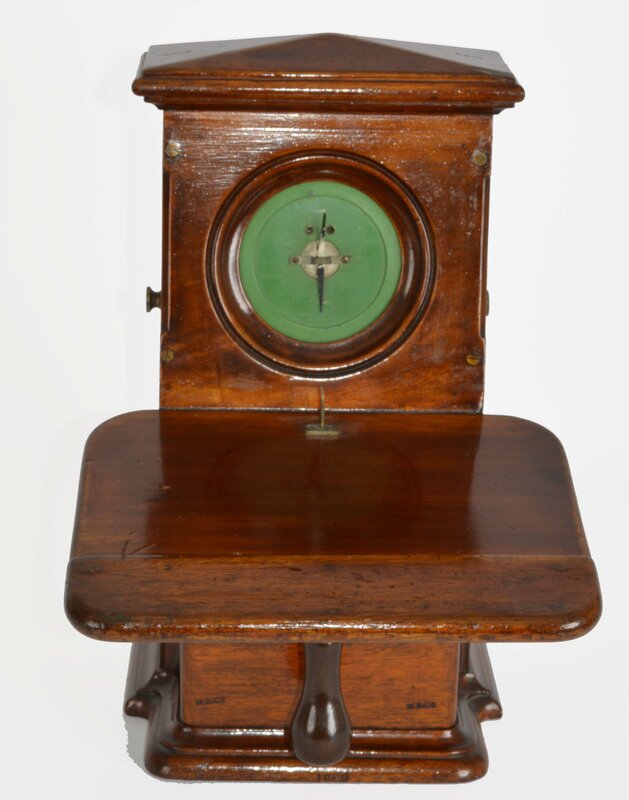 The electric telegraph had a single needle at the centre of the ‘clock’ face which could be switched (by reversing the current) to represent either a dot or dash enabling the transmission of messages in Morse code. However it was ‘wired’ communications, in the form of copper cables that would truly advance battlefield communications. Lieutenant Stopford RE and 25 Sappers were provided with two telegraph wagons a cable cart a plough and 24 miles of copper wire then tasked to set up a cable-communications system. By the end of the war 21 miles of cable were laid, this connected eight telegraph offices on a circuit furthermore an impressive 340 mile submarine cable was laid from Varna to Balaclava. An example of the single needle electric telegraph can be seen in the Crimean War display in the Museum. A small part of the 1,852 nautical mile length Atlantic cable, laid in 1865, still remains and is preserved in the Museum. The original Wheatstone transmitter which is still in use today (see below). The Ashanti King’s chair (see below). Various telephones and wireless are on display in the Boer War Section (see below). 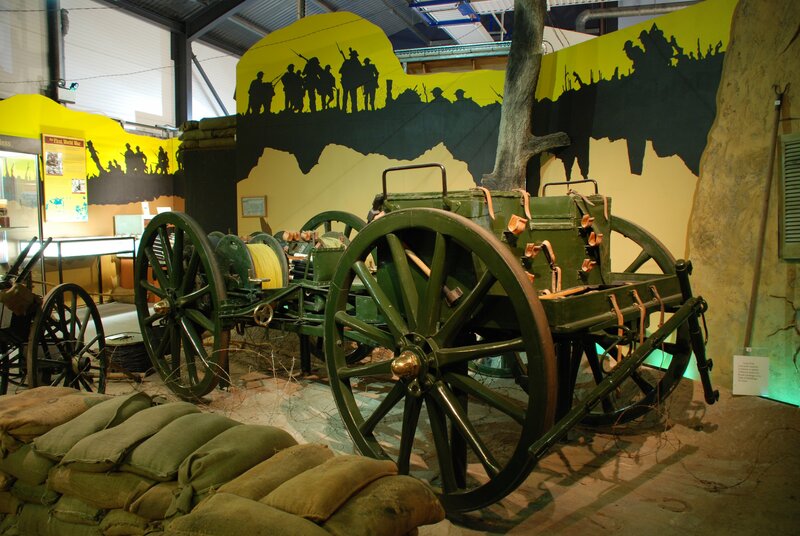 This cable wagon, on display in the museum is believed to be the only one which has survived. The Abyssinian War of 1867 brought further active service experience for field telegraphists and signallers. As a result of the experiences gained in this and the Crimean War, in 1869 authority was given for the formation of a Signal Wing at the Royal Engineers’ Depot in Chatham. In 1870 C Telegraph Troop, Royal Engineers – commanded by Captain Montague Lambert RE – was formed. The troop used land-speed morse sounders and recorders as well as the high-speed Wheatstone auto system. It kept the Headquarters of an advancing force in contact with its base by laying insulated telegraph cables along the line of advance. Some of these signal systems can be viewed in the Museum including the original Wheatstone transmitter which is still in use today. 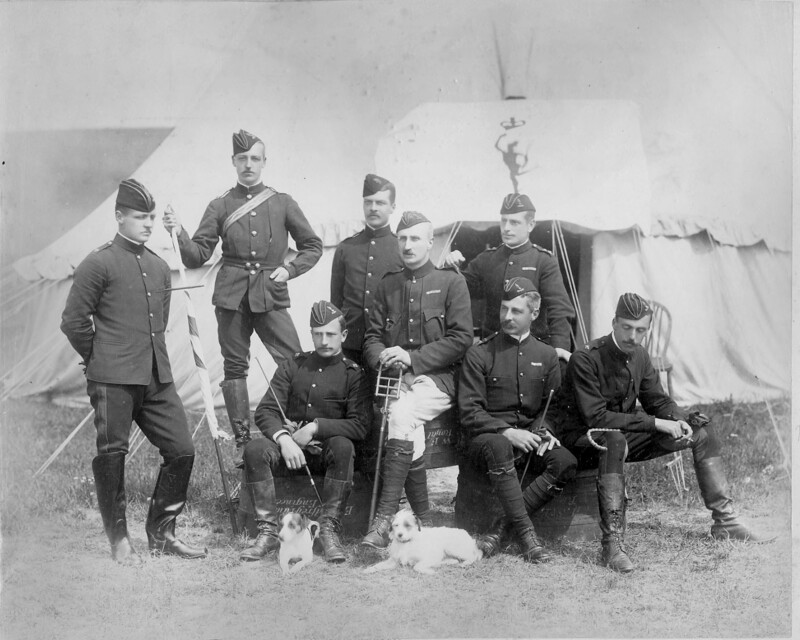 C Troop saw active service in the Zulu War of 1879 providing telegraph communications for the field army. In the Egyptian campaign of 1882 the unit laid cable in no-mans land to guide advancing British troops and later sent the first ever victory signal to come direct from a battlefield. During this campaign the heliograph first gained recognition. Heliographs (many of which were made in India) are wireless solar telegraphs that usually use flashes of sunlight reflected by a mirror to communicate primarily via Morse Code. The flashes are produced either by momentarily pivoting the mirror, or by interrupting the beam with a shutter. The heliograph was used extensively during the various campaigns on the North West Frontier of India and continued in an active service role during World War 1 and even in the desert campaign of World War 2. The next major step forward in military communications was the invention of the telephone by Alexander Graham Bell in 1876 and its subsequent introduction into military service. In 1884 ‘C’ Troop amalgamated with the 22nd and 34th Companies, Royal Engineers to form the Telegraph Battalion Royal Engineer. The Battalion took part in the Nile Campaign and later played a prominent part in the 4th Ashanti War 1895 – 1896. Members of the detachment hacked a 72 mile path through the jungle from the Cape coast to Prahsu for an overhead line. They reached the enemy’s capital and later their Commander was presented with the Ashanti King’s chair to commemorate the detachments excellent service. The original chair can be seen on display within the Museum along with various artefacts brought back from the Colonial Wars including a Zulu spear brought back from the War of 1879 and a Dongola Clock from the Nile Expedition in 1884. The Telegraph Battalion was mobilised for the South African War and it was during this war that the Wheatstone Automatic Telegraph was successfully introduced. In the years 1895 – 1898, Marconi’s experiments in the field of wireless communications were closely watched and in 1899 a wireless system complete with operators was hired by the War Office for use in the Boer War. The equipment was heavy and clumsy; the engineers could not get it to work satisfactorily in the dry conditions of South Africa and so it wasn’t taken into active service during the Boer War. The crisis in the Transvaal at the end of the 19th Century was the culmination of 250 years of Afrikaner expansion and conflict with Africans and the British. The Boers of the Orange Free State and Transvaal attacked the British in Natal and Cape Colony. What ensued was more wasteful and reckless in terms of lives and money than any war experienced by the British since 1815. War commenced in October 1899 and lasted until May 1902. These near 1000 days cost the lives of about 20,000 imperial and colonial troops of the 500,000 who participated; 16,000 of them dying from wounds or disease. Over 7,000 of the 88,000 Boers perished. The carnage also included over 400,000 horses, mules and donkeys. The war cost the British Government over £200 million. Visual communications reached a peak during the second Boer war, and was the primary means of communications for forward control. Large and small flags, heliograph and oil lamps with shutters for night communications were all utilised. Skilled operators could signal between 8 and 12 words per minute. The climatic conditions were ideal for heliograph and the 10″ mirror could be seen for up to 100 miles. The Museum has equipment to demonstrate all these forms of communications. During the Boer War the Telegraph Battalion’s section laid 18,000 miles of telegraph and telephone cable. Strategically, telegraph was used for communicating back to the Home Government by submarine cable while in theatre land line was used to control formations – down to the level of divisions and later in the war (occasionally lower). Civil telephones were used extensively in many of the large cities – such as during the defence of Ladysmith – and lines between Pretoria and Johannesburg were greatly increased. The first time a telegraph battalion provided technical and strategic communications for the army was when General French used telegraph and telephones to control artillery fire. Telegraph and telephone wires for the railway defences were added to the existing railway routes which were used extensively. As the war progressed the whole of the Telegraph Service was put under military control based on the four Provinces. The despatch service was a major means of communications at all levels. Horses, trains and runners were all important elements of the communications system. A total of 13,500,000 messages were handled in 4 years and the Battalion grew in strength from 600 to 2,500 men. Wireless was not used as an act of war in this conflict. However, some early equipment was transported to the theatre for testing by Marconi’s Wireless Telegraph Company Limited. For this reason the Boer War is often described as the first war that utilised the wireless. Perhaps it is more accurate to say it was the war that realised the potential of the wireless. No fundamental changes in the techniques of providing signal communications took place during the war in South Africa though undoubtedly it paved the way for the subsequent improvements that were to take place. In 1900 Queen Victoria sent every British soldier serving in South Africa a tin of chocolate. One such tin can be seen in the Museum. The chocolate has survived for over a century. In 1908 the Royal Engineer Signal Service was formed and later provided communications during World War 1. At this time the Dispatch Rider (DR) came into prominence and wireless ‘sets’ were introduced into service. Wireless communications were provided in France and Flanders and also in the campaigns in Salonika, Palestine and Mesopotamia. At the outbreak of WW1 there were fewer than 6,000 in the Corps forerunner – the Royal Engineer Signals Service – providing mainly a telegraph service. By the end of WW1 there were some 70,000 signallers and telephone had largely replaced the telegraph as the preferred means of communication, with the wireless and dispatch riders playing ever important roles. In 1918, at the Battle of Amiens, trench warfare was largely replaced by the birth of modern warfare. This new warfare required increasingly sophisticated communications and ever increasing numbers of soldiers specially trained in communications – thus, in 1920, the Royal Corps of Signals was formed. See Corps History.